Last night I made this Red Hot Bruschetta for my "Red Carpet" Oscar Party. Spicy sweet flavors in vibrant color tones of red. Roasted red peppers, fresh basil, tomatoes, garlic, spicy red harissa, healthy extra virgin olive oil and a hint of zesty lemon juice. 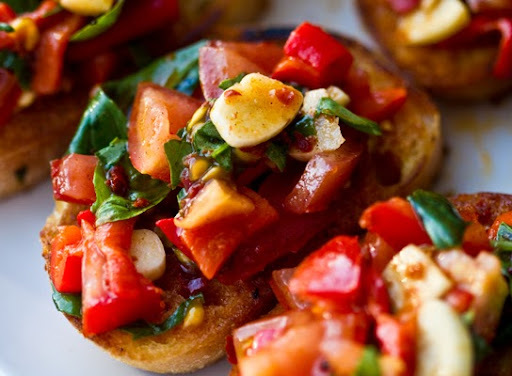 This Red Hot Bruschetta is spicy-sweet with tons of flavor. Plus this bite is quite healthy since it is made with fresh ingredients, lots of garlic and heart-healthy olive oil. Dive in! 1. Toast the bread in a splash of olive oil until the edges crisp and brown. Set aside. 2. Chop your ingredients. Combine in a bowl. 3. 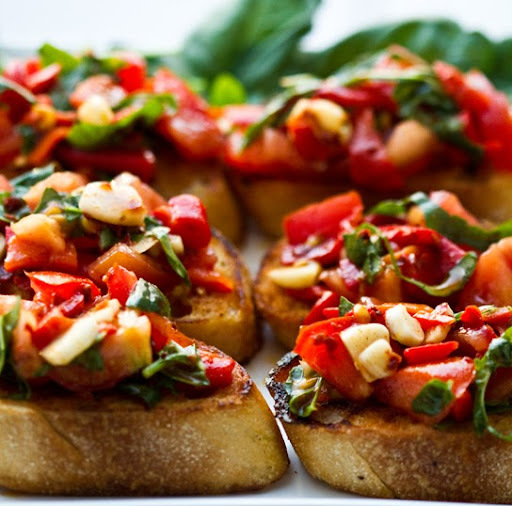 Plate your bruschetta by spooning a Tbsp of mixture over each bread slice. Serve! Pour extra mixture in a separate bowl with a spoon or make a few more rounds.